The 1962 number 6 #850 Ponytail Barbie is the same as the #5, but with a chubbier face, firmer hair texture, and no greasy face problem. She has a variety of lip and nail colors (from a light pink to a bright red). She is marked: Barbie® Pats. Pend. © MCMLVIII by Mattel Inc. In the box Barbie wears a red one-piece swimsuit & red open toe heels, pearl earrings, white sunglasses with blue lens, and has a black all wire stand and booklet. 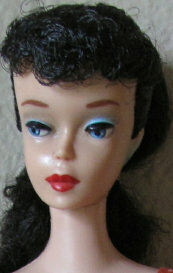 The 1961 number 5 #850 Ponytail Barbie has a new hollow body and new hair color; titian. Her bangs feel more coarse. 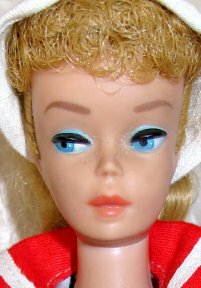 She has blue eyes, red lips and available in blonde, brunette or titian hair colors. Also the T.M. symbol was replaced with the ® symbol after the word "Barbie" on her body marking. Many of the #5 dolls had a greasy face problem. 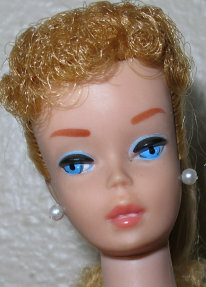 (There was a breakdown in the vinyl they used to make the dolls, which soon Mattel corrected.) She's the first Barbie to come in the package wearing a wrist tag (earliest tags were red and then changed to gold foil). She is marked: Barbie® Pats. Pend. © MCMLVIII by Mattel Inc. In the box she wears her black and white striped one-piece swim-suit, black open toe heels, pearl earrings, white sunglasses with blue lens, and has a black all wire stand, and booklet. NOTICE: This page has an issue with the graphics. Still working on it! 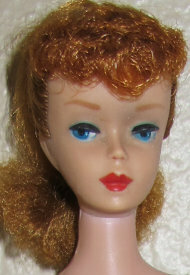 The 1963 number 7 #850 Ponytail Barbie had the barbie/midge body with a larger neck knob. 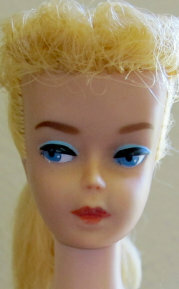 Everything else is the same as the #6 except she is marked: Midge T.M./©1962 Barbie ®/©1958 by Mattel, Inc. In 1964 and 1965 they added the word "patented" to the end of the marking. In the box Barbie wears a red one-piece swimsuit & red open toe heels, pearl earrings, white sunglasses with blue lens, and has a black all wire stand and booklet. Disclosure: eBay & Amazon Affiliate - When you click through to buy products I may earn a very small compensation. 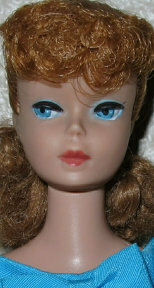 Your purchase helps keep My Vintage Barbies up to date for my readers. Thank you so much for your support!